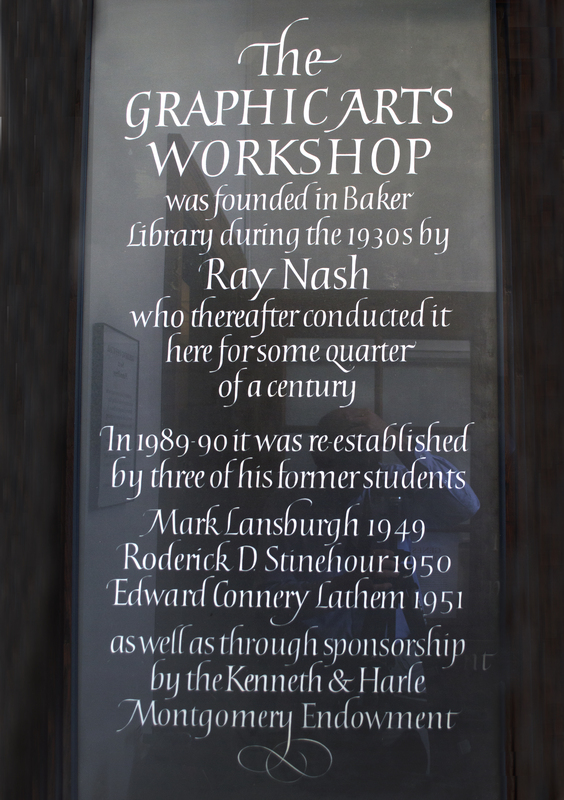 A permanent plaque was created to commemorate the re-establishment of the Graphic Arts Workshop at Dartmouth College and Ray Nash’s pioneering work. Nash’s son John, a well-known calligrapher now based in London, was responsible for the stone sign, the last brush lettering and letter-carving jobs he did for the Baker Library, Dartmouth. John Nash, “Graphic Arts Workshop sign,” ourheritage.ac.nz | OUR Heritage, accessed April 26, 2019, http://ourheritage.ac.nz/items/show/10147.